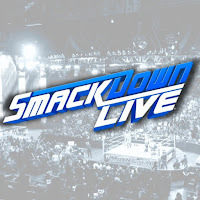 Tonight's WWE SmackDown opens with a look at Becky Lynch's Royal Rumble performance and her confrontation with WrestleMania 35 opponent RAW Women's Champion Ronda Rousey on last night's RAW. We're live from the Talking Stick Resort Arena in Phoenix, Arizona as Tom Phillips welcomes us. He's joined by Corey Graves and Byron Saxton. - We go right to the ring and out comes Becky Lynch. Greg Hamilton does the introduction. Becky says this has been a couple of days. A lot has happened in Phoenix. Last night, she showed up on Raw. She says she couldn't resist looking at Ronnie in her angry little eyes. It took her two seconds to confirm how different they really are. The beginning of the Royal Rumble did not go her way but she does not crumble when she loses, like Ronda. Becky says she went out and won the Royal Rumble on one good leg. Becky says Ronda the arrogant dope wants to talk about Becky working her way up while Ronda was on top. Becky says she is proud of working her way up and slapping all the heads to get here. She worked from the pre-show of Wrestlemania last year to being this year's main event. Nobody handed her nothing. Becky says the main thing she saw when she looked in Ronnie's eyes and it is something she does not have and that is doubt. Becky says she will break Ronnie's arm in front of the world. If you don't believe that, you will be carried out knowing it. Charlotte Flair interrupts and makes her way to the ring. Charlotte applauds Becky before saying anything. Flair congratulates Becky on making it off the Kickoff. Flair mocks Becky a bit and fans chant for Becky in response. Flair says she's proud of Becky too. Flair says Becky wasn't even in the Rumble but somehow she got herself in and won. Flair says maybe Becky learned something from her. Flair says Becky grew into The Man by learning from The Queen. Flair says it was she who brought Becky to the main event. Flair says she's so happy she could do all of this for Becky - the main event, the fans. Becky drops Flair with a sucker punch. Becky exits the ring as her music hits. Flair runs out of the ring and drops Becky from behind on the ramp. Flair unloads but Becky fights back. Flair sends Becky knee-first into the barrier. Officials are out to break them up but they keep brawling. Fans chant "let them fight!" now. Becky breaks free and takes Flair down again at ringside. Fans chant "Becky's awesome!" as officials break them up again. Becky's music hits as they have words. - Still to come, WWE Champion Daniel Bryan will be here. Also, a celebration for the new SmackDown Tag Team Champions. We see new WWE United States Champion Shinsuke Nakamura backstage. 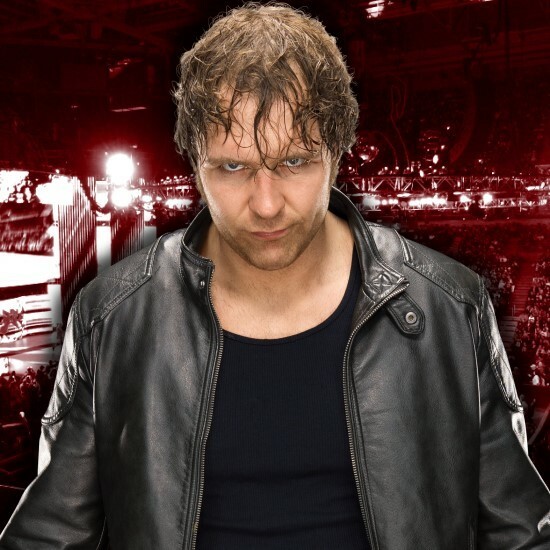 He will defend against R-Truth. We go to commercial. We are back and R-Truth and Carmella make their way to the ring. R Truth asks if you want to know what's up. At the Royal Rumble, he got jacked up thanks to Nia Jax. He never got to enter the Royal Rumble match at number 30. Carmella says they worked hard to earn the number 30 spot and they deserved to be in the Royal Rumble. Truth says he was rapping and then a minute later, he was napping. 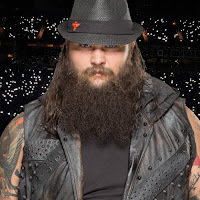 Truth says that if he was in the match, he would have won the Royal Rumble. Everyone knows that, including the McMahons who gave him this United States Title Match. Nakamura with a kick as the bell rings. Nakamura with a knee and reverse exploder. Nakamura sets for Kinshasa but Truth with a Lie Detector and Nakamura rolls to the floor. Truth rolls Nakamura back into the ring and he gets a near fall. Truth with another near fall. Truth with a sit out gourdbuster for a near fall. Truth misses a splash into the corner and Nakamura with a kick to the back of the head. Nakamura sends Truth to the mat and kicks him. Nakamura gets a near fall. Nakamura chokes Truth in the ropes and kicks Truth in the back of the head. Truth with punches but they have no impact. Nakamura with a guillotine on Truth. Truth with punches but Nakamura pulls Truth to the mat and connects with knees and kicks. Nakamura chokes Truth in the corner. Nakamura with a forearm but Truth with a punch . Nakamura with forearms and then he puts Truth on the turnbuckles. Nakamura with a running knee to the midsection and then he connects with a second one. 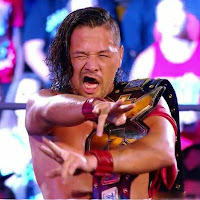 Nakamura sets for a third running knee and connects. Nakamura gets a near fall. Nakamura gets Truth on his shoulders but Truth with a rollup for the two... No, it's a three count! It looks like they may have botched the pin there. After the match, Nakamura argues with the referee as there is some confusion. Truth is announced as the winner and the new champion. Carmella enters to celebrate with Truth and Nakamura can't believe it. Rusev and Lana interrupt the celebration. Fan chant "Rusev Day!" now. Rusev says none of this is right. 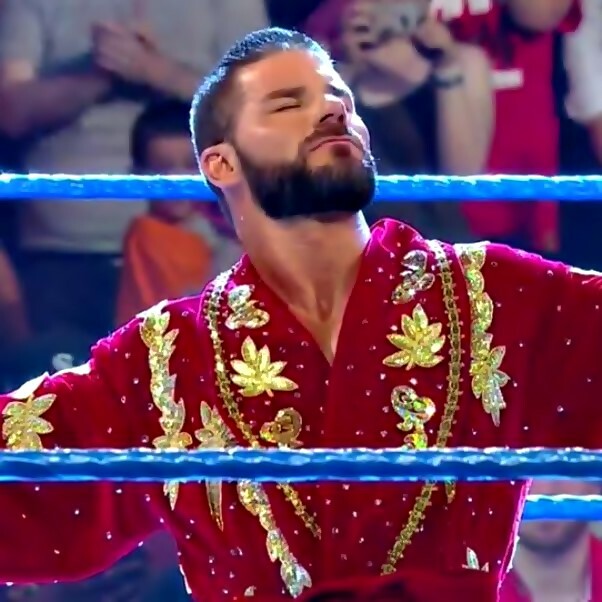 He took the title from Nakamura previously because the title deserved better, and if it deserved better than Nakamura then it definitely deserves better than Truth. Rusev proposes they have a match right now, if Truth isn't too tired. Carmella and Lana argue. Carmella shoves Lana to the mat. Rusev and Truth face off in the middle of the ring. They shove each other. Truth grants Rusev the title shot. We go to commercial. The match is joined in progress and Rusev with a reverse chin lock. We see footage from the commercial break when Rusev hit a drop kick to get a near fall. Rusev maintains the reverse chin lock. Rusev with an Irish whip and running hip into the corner. Rusev with an Irish whip and Truth with a sunset flip for the three count. After the match, Truth's celebration is broken up by an attack from Shinsuke Nakamura. Truth is sent back into the ring and Rusev attacks Truth. Nakamura enters the ring and he joins in the attack on Truth. Nakamura holds Truth and Rusev with a Machka Kick. Fans boo. Nakamura with a Kinshasa to Truth. - We take a look back at what happened between Charlotte Flair and Becky Lynch. - We see Becky limping to her vehicle and she is asked why she refused medical attention. Becky says she is fine and does not need to spend any more time on the shelf. Becky leaves the arena. - Rey Mysterio makes his way to the ring for his match against Samoa Joe. But first... We go to commercial. - We are back and we see R Truth in the back and he is being checked on by the medical staff. Truth says he is good. Almas attacks Rey from behind and hits a suplex and then holds on for another one but Rey with a knee to stop the third suplex. Rey sends Almas into the ropes but Almas with an elbow to stop the 619. Almas with a hammer lock DDT. Luke Gallows and Karl Anderson confront Rusev backstage, asking what the hell happened out there. They're not happy with how Rusev and Shinsuke Nakamura beat R-Truth down. Rusev tells Anderson to go back to catering and take his girlfriend Gallows with him. Anderson says Nakamura and Rusev wouldn't do so well against a couple of good brothers. Nakamura appears and accepts the challenge. Gallows and Anderson walk off. Rusev gets in Nakamura's face and says he will team with him one time, but Nakamura better not screw him over. Rusev walks off. - Shane McMahon and The Miz are backstage walking with their titles. Shane says Miz is going to love what he has planned for their celebration. Back to commercial. - We take a look at the premiere of Fighting with My Family at the Sundance Film Festival. Miz and Shane McMahon make their way to the ring. Miz asks if the surprise is that there is no surprise? Where is the confetti, champagne, and balloons? Phoenix wants to party with them. Shane says they don't need confetti, streamers, and champagne. Shane says a childhood dream came true when they became tag team champions. 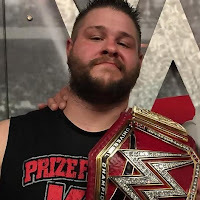 How can he repay Miz? Shane says the one thing he can do for Miz, and you will not forget this for the rest of your life. Shane says he took them on a journey and it has been a little weird. Shane has put together a video. Shane says he was trepidatious and he did not know why Miz wanted to be his partner, but then he realized why he did it. Shane says the one motivating force that makes you who you are. Shane brings out Miz' dad. Shane says he asked his dad something special and he gives the mic to Miz' dad. George tells Mike that he loves him and he is very proud of him. Shane starts to tear up and he says that they need to defend their tag titles. 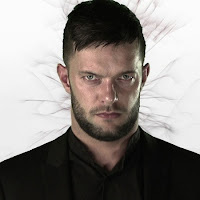 Shane says we will find out who their opponents will be and it will be determined in a four way elimination match. - The Usos are out first, Jimmy Uso and Jey Uso. We go to commercial. Mandy Rose and Sonya Deville announce that they are going to challenge for the Tag Titles at Elimination Chamber. Mandy says it is not easy being her when you look like her and are part of the fiercest tag team on the planet. She mentions Naomi. Mandy shows why she has issues with Naomi and we see Naomi running them down during Tough Enough. Mandy is asked if she is trying to destroy Naomi's marriage because she called her weak. Sonya says that Mandy has not been the same since that day. Mandy says she went home and cried until she had a complex so bad her boyfriend couldn't take it and he dumped her. That is why she is trying to break up their marriage. Mandy says her mind is on the Elimination Chamber Match. Naomi will be the last thing on her mind when they win the tag titles. Otis and Jey start things off and Otis with a shoulder tackle. Kofi tags in and he kicks Otis. Otis misses punches and Kofi with kicks and Otis drops down when Kofi goes through the legs. Big E tags in and Big E dances to the trombone. They both go for clotheslines and neither man moves. Otis goes for a shoulder tackle and Big E goes for an abdominal stretch but cannot apply it. Otis tries to do the same. Otis with a slam. Tucker tags in and they hit a double splash on Big E.
Jimmy tags in and applies a side head lock. Cesaro tags in and connects with a knee to Knight's back and he kicks Jimmy in the corner. Sheamus joins in the attack. Cesaro tags back in and they hit a double clothesline on Jimmy for a near fall. Cesaro with a reverse chin lock and he rubs Jimmy's face in the mat. Cesaro with a daedlift gutwrench suplex followed by a knee drop from Sheamus for a near fall. Cesaro tags back in and he applies a sleeper as we see Shane and MIz watching from the back. Jimmy with a jaw breaker and both men are down. Sheamus tags in and he knocks the New Day off the apron. Jey tags in and clotheslines Sheamus. Jey with an uppercut and Samoan drop for a near fall. Big E tags in as Jey goes to the floor. Sheamus with a knee and punches. Kofi with a kick to the chest and he tags in. Kofi with a double stomp off the shoulders and Cesaro breaks up the cover. Big E punches Cesaro and he connects with a Foley Clothesline to the floor. Otis tags in and Kofi with a pendulum kick. Otis catches Kofi off the apron and they hit the Compactor on Kofi for a three count. Tucker and Jey are in the ring and Jey knocks Otis off the apron and then Tucker goes over the top rope to the floor when Jey drops down. Jimmy with a plancha and Cesaro makes the tag. Sheamus and Cesaro pick up Jey and drop him on the ringside barrier as we go to commercial. We are back and Cesaro with an elbow drop to the back and he applies a rear chin lock. We see Jimmy being sent into the ringside barrier during the commercial and we see them down on the floor. Tucker with a side slam and Sheamus makes the tag. Knight and Sheamus are down as Otis and Cesaro tag in. Otis with a shoulder tackle to Cesaro and splashes to Sheamus. Otis with an overhead belly-to-belly suplex. Otis with a splash to Cesaro and Sheamus in the corner. Otis looks around and it is time for the Caterpillar. Otis gets a near fall. Tucker tags in and they go for the Compactor but Sheamus grabs Tucker's leg. Otis catapults Cesaro to Tucker for a power slam and a near fall. Cesaro with a boot to Tucker. Jimmy tags in and hits a cross body on Tucker for a near fall. Jimmy goes for a super kick but Otis blocks it. Jimmy with an enzuigiri. Jimmy with a super kick to Tucker. Sheamus tags in and Sheamus gives Tucker a Brogue Kick after a European uppercut from Cesaro. Jimmy with a super kick and a plancha onto Cesaro. Jey with a frog splash onto Sheamus for the three count. - Daniel Bryan is in the back and he knocks food out of a backstage worker's hands. We go to commercial. We are back and WWE Champion Daniel Bryan makes his way to the ring. We see photos from the match from Sunday night. 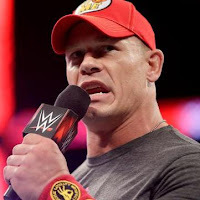 Daniel asks if you know who won this past Sunday at the Royal Rumble? Daniel says it was each and every one of you. You all won and your children won. Your children's children all won because Daniel Bryan won. Because a victory for him is a victory for every sentient being on Earth because he is the planet's champion. Daniel says he does not expect all of you to understand what he is saying because none of you know what winning feels like. Daniel says he found someone who understands the truth in everything Daniel says. He did not come out for Daniel, but for the greater good. Daniel asks what do you see when you see Rowan. You see the dirt under his fingernails and think he is a mindless runt. He spends time at night reading. Daniel says Rowan is his intellectual peer. He can see through the facade of AJ Styles. AJ Styles could be right some time. He suggested that Daniel was a hypocrite. Daniel says he is a hypocrite. It is because he carries around this belt. Daniel says this is a symbol of excellence but it is also a symbol of excess. It is gaudy, made from cheap labor, and bound to the skin of a cow whose life was taken from her. Daniel says the cow who gave her life was named Daisy. Daisy had the ability to feel immense joy which she did not get to enjoy much of in this life. She also had the ability to feel immense pain. She was forced to give her life for this symbol. This symbol is the very thing that Rowan and he stand against. Daniel throws the title in the trash and says that the title belt is trash. Daniel says when he became the WWE Champion, he would change the world. To change the world, we need new symbols. Rowan gives Daniel a new belt that is the new symbol of excellence. This is your new WWE Championship. Daniel says the people are ignorant. This belt is made from 100% organic sustainable hemp from a naturally fallen oak. AJ Styles interrupts when his music plays. AJ asks Daniel if he thought he would sit in the back while Daniel threw the WWE Championship in the trash. AJ asks Daniel if he smoked the prototype. AJ says for someone who doesn't like corporations, Daniel found the biggest insurance policy... Randy Orton's music interrupts and we go to commercial. Back from the break and Mustafa Ali is out. He starts in on about what he's done but Orton reminds him he was eliminated by a woman at the Rumble. Ali responds but Samoa Joe's music hits and out he comes to interrupt. Jeff Hardy is also in the ring. Joe says he came to put a champion to sleep and the others should get out of his way. Joe takes shots at Hardy and Ali. Bryan and Rowan go to the floor to watch as Joe enters. Joe gets in AJ's face and AJ decks him. Orton drops Joe with the RKO. Bryan rants about how none of them will get a WWE Title shot. The brawl continues in the ring as Bryan rants about how he will be champion forever. Triple H appears on the big screen and announces that Bryan will be defending the WWE Title against all of these Superstars, inside the Elimination Chamber. Bryan throws a fit and a "yes!" chant starts up. Orton tosses Ali to the apron. Hardy unloads on Orton, then Ali unloads on Orton in the corner. Rowan and Bryan retreat. Ali tosses Hardy out. Joe fights AJ through the crowd. Orton drops Ali at ringside. Hardy is down against the barrier. Ali fights Orton up the ramp as Bryan and Rowan watch from the stage. Rowan charges Ali and Orton as SmackDown goes off the air.